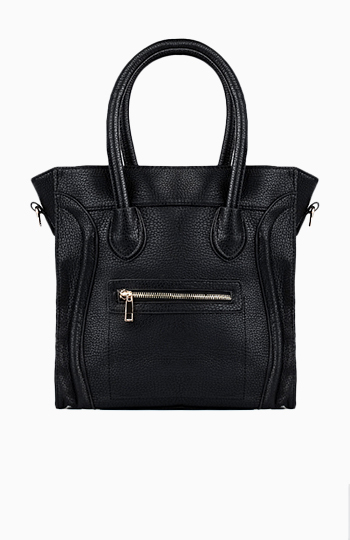 Handbag with structured handle. Exterior zippered pocket. Main zippered closure. 3 interior pockets ( 1 zippered, 2 open). Detachable shoulder strap. Full lining. Faux leather. Love this bag!! It had a little tear on the handle part of the purse but nothing to noticeable! All in all, just the tote I was looking for!! I ordered this bag in brown. I was really skeptical about the color, because the picture doesn't look very flattering; however, it does look better in person. There were some stains on the inside of the bag, but it can't be seen. Overall, I'm pleased with this bag. I bought this in black and I love it. I've gotten so many compliments from the ladies at work. This is a great bag! LOVE this bag! I use it for my books at school, which is sort of a heavy load, but it seems very sturdy and i think it will last for a while!! I love it so much that on a normal day I just take out my books and use it at a purse! I ordered the one in black! Love it so much! Suitable for me to bring my laptop to work. But one thing, I found there's some sticky thing which stick on the "screw" which are on the bottom of the bag. I ordered this bag in red and I LOVE it. It's large and perfect for everything I need to carry. The over the shoulder strap is great too.